Here is a different idea for breakfast. Wonderful savory apples and cheese create a warm satisfying breakfast. Spray the bottom of small muffin pan with cooking spray. 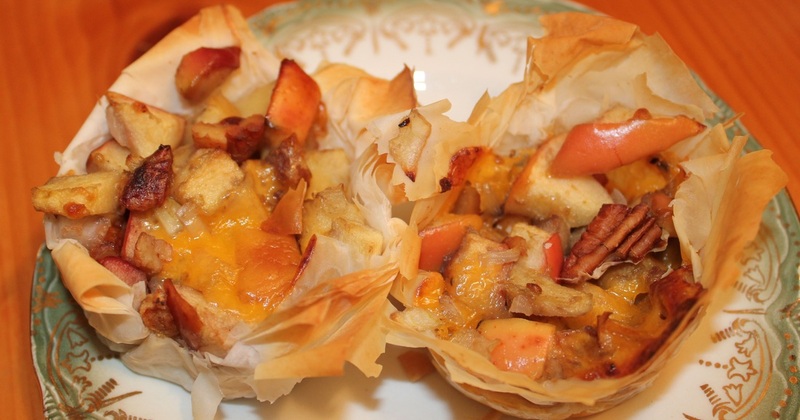 Cut phyllo sheets to line muffin pans. Spray the tops of phyllo dough with cooking spray and bake for 5-6 minutes. In a large skillet, melt butter. Add apples and onions, stirring until tender. Remove from heat, add cheese and pecans. Stir well. Place some apple cheddar mixture into each cup. You can skip baking the phyllo dough first and just fill them with the mushroom filling, but the bottoms will be soft not crispy.